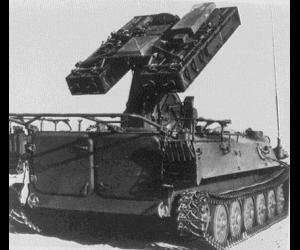 The Strela 10M3 tactical air defense system reached IOC with the Red Army in 1981 to replace the SA-9 Gaskin as IR component of the battlefield defense network. Its radar launched counterpart, the Tunguska 2S6 system, replacing the 9K33M3 Osa, was not introduced until 1989. The 10M3 system is a modified MT-LB infantry carrier with a quadruple launcher for 9M333 missiles. Compared to the SA-9, which uses the BRDM as chassis, the MT-LB offers greater mobility but has the disadvantage of lesser armor than the BRDM (7mm for the MT-LB against 14mm for the BRDM-2). The 9M333 missile is an IR guided short range missile with a HE warhead an a laser fuze. Four missiles are ready for use, a further four are stored in the TELAR vehicle. Target acquisation is reached with a second generation IR/EO system and a 1RL246-10-2 (NATO: PIE RACK) IFF system. Target search is performed by a 9S86 (NATO: SNAP SHOT) short range radar. Target search at battery level is done by a MR G-band radar on MT-LB chassis (NATO: DOG EAR) and by a passive ESM system, 9S16 (NATO: FLAT BOX-B). The launcher is even capable of firing early missiles of the Strela series (NATO: SA-9 GASKIN). Each vehicle has a 7.62mm machine gun of the RPK type for self defense. Obsolete. Since NATO has never made wide use of IR-guided tactical SAM's and the russian Pantsyr system will not replace the many SA-13's (ca. 400) in russian service, the 10M3 system is still the most capable, widely proliferated (22 countries) IR system. The upcoming US Army M6 Linebacker system is more sophisticated than the 10M3, but is lacking IFF, and the range and ceiling of the 9M333 missile.